A freestanding masterpiece! 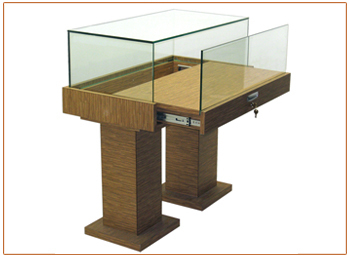 This custom Impression pedestal display case features a pull-out drawer for inside access. Glass-to-glass bonding allows merchandise to be viewed from any angle. When you’ve got to impress, think Impression Series! The pick of leading national jewelry and perfume chain stores, now you can have the display cases that will ratchet up the prestige appeal of your luxury items! Unsurpassed quality innovatively paired with a host of maximally user friendly features, including pull out drawers, glass to glass bonding, LED lighting and a whole lot more. View another glass pedestal showcase here.